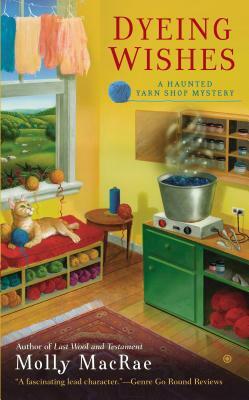 Kath Rutledge's grandmother left her a charming fiber and fabric shop, a close-knit group of needlework lovers, and a television-addicted ghost in the attic. She may also have inherited the special skills required to untangle a murder. Always up for trying something new, Kath and her friends from the fiber and needlework group TGIF--Thank Goodness it's Fiber--are visiting Cloud Hollow Farm for the day to learn the fine art of dyeing. With spring in the air, the friends head out to greet the sheep. But the sheep are more interested in something else--two bodies spread under a tall tree. And one of those bodies is someone they know.